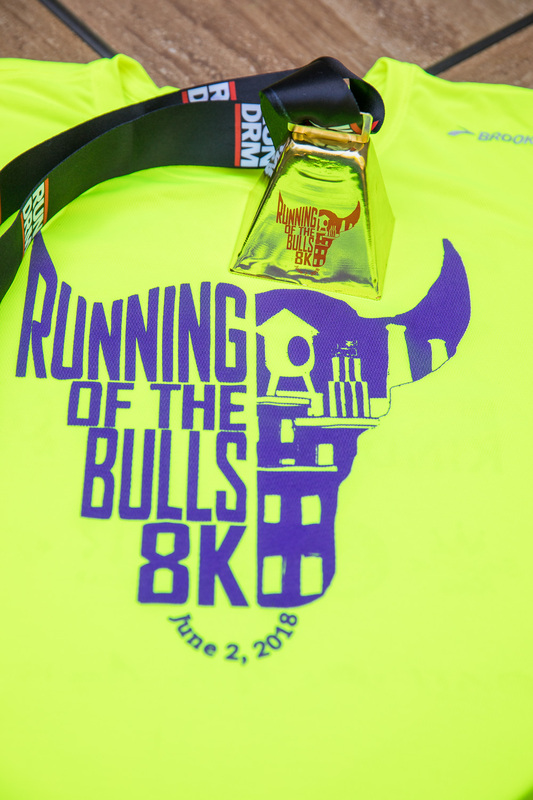 I took a new approach to the Running of the Bulls 8K race in downtown Durham this year and actually decided to train. Well, actually, I'm a crazy lady who's training for some truly insane fall races, but it just so happens that the training includes being trained up for an 8K. My goal for this race was just to do better than what I ran last year. Last year I finished in 50:33 (10:10 pace), so I was aiming for sub-50:00 finish. But then, according to my mile time pace predictions per Fleet Feet's speed series group, I should be running 10Ks at 8:47 pace. Yeah, as you can imagine, 10:10 is vastly different than 8:47 so either something is up and the pace prediction is wildly optimistic or I'm clearly not pushing myself hard enough at races. (I'm betting it's some combination of the two.) I was discussing race goals with McCrae the night before and looking over my target paces, and McCrae said, "Why not run a 9:30 pace?" "What? Are you crazy?" I asked him. "No, why don't you push it and run a 9:30 or 9:40 pace?" "Because my best 5 mile pace was 9:29 and that was in October 2015 at Bull City Race fest. There's no way I could run the same pace on a similar course in the middle of a hot and humid summer." Race start as usual was uphill and straight into a construction zone, which made it a bit tough to settle into a pace. There are no corrals at this 8K so you're supposed to self-organize, which means everyone (myself included) optimistically or foolishly believes they should be in the front half of the crowd. However, starting up a narrow city street on a hill and cutting into a twisty construction zone makes getting into a pace a challenge. There were plenty of people that I was weaving hard to get past and there were plenty of speedies for whom I was trying hard to get out of the way. All in all it makes for a tough first half mile, but I eventually fell into a good running rhythm. Since I felt pretty good that morning, why not push the pace a little? "Just push the pace at the start of the race and see how you feel. If you can't maintain it then pull back," McCrae had encouraged me. I'm not sure if I was necessarily striving for that sort of pace, but when I was trying to weave through the chaos that was the first half mile I kept glancing down at my watch and seeing disheartening paces like 10:30 or so. "Oh no! My sub-10:00 goal!" I lamented to myself, and kept pushing the pace a little more. And maybe it was the extra effort or maybe my GPS watch finally picked up a decent signal, but I paced that first mile at 9:14. Whoa! 9:14?! What is this madness?! I was feeling good though so I kept it up, reeling it in just a bit for some of the hilly parts of Durham, and keeping a decent pace: 9:35 and then 9:44 miles. But gosh, mile 3! There's a section of the course that runs past the old Durham Bulls stadium and up Morris Street. Running past the Durham Athletic Park was exciting because I was running past just as the top woman finisher was crossing the finish line, so I spared a few breaths to cheer her as she finished. After that I had the usual Oiselle cowbell corner to look forward to: every year my Oiselle teammates get a group together to spectate and cheer the Running of the Bulls 8K in a strategic spot where the course doubles back on itself (so you can cheer the same people multiple times!) and I got a huge surge of energy from them as I passed. But once I was past the ballpark and my friends I started noticing the hill. I started reeeeeeeally noticing the hill. Yeah, I might have taken a 15 second walk break to catch my breath. Of course, shortly after I finished that monster hill there was a water break, so give that another 15 second break to down some water (I had to walk to drink because I couldn't swallow the water otherwise) then no wonder a whole 30 seconds slipped past unnoticed, hence my 10:16 pace for mile 4. After the race Ryder was like, "Hey mom, I'll like that salt off your face for you..."
2018 (left) race medal was gold with black ribbon. 2017 (right) race medal was silver with orange ribbon. Both are cowbells! I had another mile left to go through hilly Durham and I was starting to despair of my sub-10:00 per mile goal, but of course I forgot that this course is special: that hill on Morris Street might kill your mile 4 time, but you get to experience the magic of running down that same hill to the ballpark finish once you've looped around downtown. And magical indeed this hill was: I sprinted down the hill and around the baseball stadium, clocking in a 9:03 mile to the finish line. All in all I crushed my goal: 47:49 for my chip time at a 9:37 pace! This was an 8K PR (duh, I've only run this race twice) and pretty close to my 5 miler PR. There was the usual swag of course: cowbell race medal, Running of the Bulls tech tshirt, and plenty of freebies from booths at the race finish. Add in catching up with a few Fleet Feet friends in the ballpark after the finish line and then brunch with Oiselle teammates and yep, I'd say this was a fantastic race. I have officially completed a full marathon event! Well, with a little help from my teammates. I met up with my NC Oiselle Volee teammates on Sunday morning for the City of Oaks marathon relay in Raleigh, with 26.2 miles split across four runners. We had five teams running so it was quite a crowd, with plenty of snacks and selfies. 200 miles. 12 teammates. 2 vans. A relay race from Raleigh to Atlantic Beach, and a whole lotta tuna. On Saturday night as we drove to the next big exchange point after what was supposed to be a quick bite at Wendy's I sat in the back seat of the van with my legs kicked up and my Richmond half marathon blanket draped over my sore legs and watched brown-gold fields chase the sunset. Some fields were cotton - half-harvested or brow-beaten with white balls - the closest to snow that ever settles on those furrowed fields. Some fields contained soybeans - either thin from recent harvest or heavy with dry or moldy bean shells for crop rotation, already longing to burrow and return to the soil and elude the dull grey winter that in this Indian summer seemed impossibly far away. But the crops knew that winter is coming. Brown naked stalks of tobacco stood sentinel in some fields, though there were much fewer fields than there were twenty years ago or even ten years ago. As we drove east I looked behind us at the shrinking fields and watched the sky purple into twilight, a soft nostalgic smile curling at my lip corners. Tuna Run 200 this year was very different from last year - check out the full race report! I'd always wanted to run the Bull Moon Ride and Run. It's a must-do local race that benefits Habitat for Humanity of Durham, a nonprofit I've volunteered and fundraised for previously, and for some reason the last few years I've been out of town or I've had some other conflict. So when Travis and Kristen and I decided to run the race this year, I was stoked. I was driving to downtown Durham when I realized this would be my first 5K race. I did things a little backwards starting with five half marathons, three 10-milers, a few 5-milers, an 8K and a 200-mile relay race. But I'd never raced a 5K, and it was electric in downtown Durham by the time I arrived at the start line.